Once the tallest building in the world, the CN Tower juts out over and above the central district of Toronto, 147 stories high. Two days ago, as I stood gaping at it alongside other wide-eyed passersby, I knew I had to get up there and stand on its edge. After all, how many people can boast about doing “the Titanic” 116 stories high, without any fence or barrier? As I open my eyes and tilt my head, I can see the speck that is the city centre of Toronto, filled with ant-sized people and cars. The vast blue expanse of the Ontario Lake stretches in the distance, all the way to the white mist created by the Niagara Falls. I lean forward, grab the rope, and walk a small step in. Our group of six then treads along the edge, holding on to the rope with one hand, trying to maintain balance with the other, and marveling at Toronto’s landscape as it transforms along our 360 degrees loop – from the blue backdrop of the Ontario Lake, to the financial district with what look like miniature buildings, to residential Toronto with neighborhoods interspersed with a deep green color. When I hang my toes over Toronto, the world looks up at me in awe, wondering if they too should walk on the edge. I throw my arms open and yell, Hell yeah! The CN Tower juts out in the Toronto sky. Here is a short video of my Edge Walk at CN Tower. Front Street, Downtown Toronto. When you walk along the city centre, look up and the tallest tower you see is CN Tower. It is 553 metres / 147 stories high, and remained the tallest tower in the world for 36 years, until 2010! The Edge Walk happens only in the summer months, during which time it is a rain or shine event. I was lucky to have a clear, sunny day and be able to see Ontario Lake stretch out in the distance. But I saw pictures of misty days, when instead of leaning above the city centre, people are literally leaning in the clouds! The cost per person is CAD 175 (~ INR 9,700), and includes a video and photo from the walk, as well as return entry to the rest of CN Tower (the LookOut, the SkyPod etc) within three days. Would you like to do the EdgeWalk in Toronto someday? Have you ever done something similar? *Note: My EdgeWalk was sponsored by CN Tower. Lucky me! Read more stories from my trip to Canada, and join me on Facebook, Twitter and Instagram to follow my next adventure! It would be so much fun without the rope. It was so much fun with the rope :p Without the rope, it would just be nerve wrecking! Haha, maybe you should give the latter a try. I remember hearing about this when it first started. I don’t know if I could do it myself though! Although it looks like a great time. Oh you have to give it a try. It’s much less scary than it looks, and ultimately you start trusting your harness 😉 Go for it and tell me how it goes! It sure was! Would you try it?! Shivaya, when you were on the edge..my heart went thud..thud..:) I am sure you are thrilled..
Haha, mine did too, Chitra! In retrospect though, it was more fun than scary 😉 I hope my mum isn’t going to watch it! It really was, Pete, and the views were stunning too! Wow, a Vertigo Climb sounds interesting. Do you actually climb the tower? 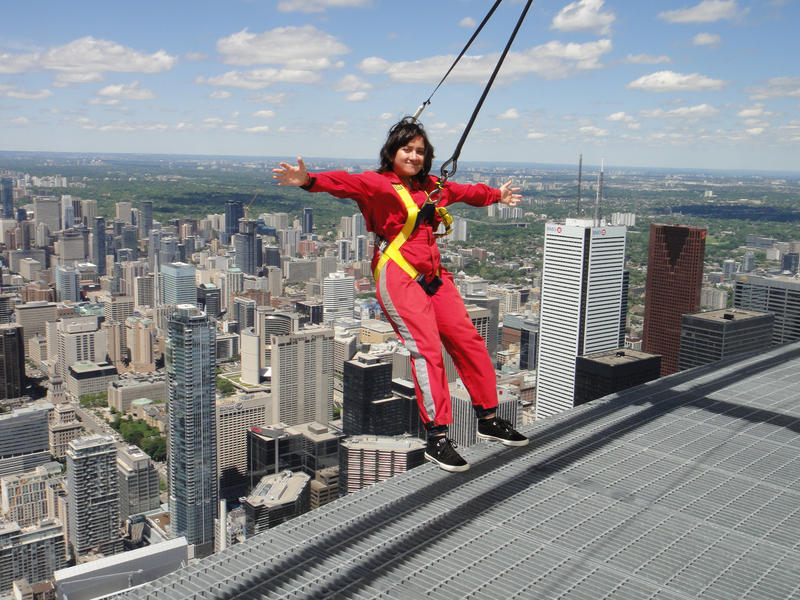 Great that you did this:) I was in Toronto last year but couldn’t try the edge walk!! Definitely wish to do this someday..
Pingback: What's so special about the CN Tower? 3 top reasons to visit. Previous Post#WeGoSolo Contest: Your Dream Solo Travel Destination! Next Post6 Lessons From My First TBEX.